In a bid to come up with a working solution to the world’s food security issue, Peter Bickerton found his research kept returning to Entomophagy (eating insects). Ok, perhaps he didn’t feel quite so confident that he had found ‘the solution’, but with 80% of the worlds population already enjoying insects as part of their daily diets, he was curious as to why the West depended so heavily on cattle for their sustenance. Almost four years later, Peter no longer eats meat but occasionally treats himself to insects which he describes as ‘delicacies’. Sustainability is a pressing issue, and so I met Peter to discuss whether he thinks insects are a genuine solution to this rapidly growing problem, and asked whether (in all honesty) he does enjoy eating them. Why did you first start eating insects? Sustainability and food security mainly. I came across Thought for Food in 2011 and decided to enter because I had a real interest in what they were trying to achieve. Thought For Food is an international competition for students where the aim is to come up with a solution to the global food crisis in teams of 3-5 people (from any university in the world). We came up with so many ideas, and thought of so many things; we researched the whole system. In the end insects seemed like the most realistic solution. I’d never really thought about it before then. Well, living in England you don’t really have to think about it. If you see a cow in a field it looks like a pretty sustainable way to produce meat. They fart a lot, but the resource use isn’t that bad. That’s what you can see, but that’s not the case everywhere around the world. Most cows don’t live in grassy fields; cattle are fed with grain in most cases, so rainforest is chopped down to plant more grain, and then cattle also need a massive amount of water as well. Cattle and livestock account for about 70% of our global water intake. There’s something like 1.5 billion cattle of the planet, so there’s more cow than human in terms weight and mass, and cows consume 15 times more than we do. On a daily basis the amount of waste created by animals in America alone is 100 times the whole human population. That’s 100,000 metric tonnes of waste a minute. It’s insane. The waste is a big problem. It’s not managed properly and a massive amount goes into the rivers. It’s terrifying. In the ‘Thought for Food’ competition, once you’ve had your initial idea they send you materials to help you brainstorm and then they set you up with really interesting and amazing people from around the world – people in business or agriculture – and they help you to develop your idea. In the end the teams sell their idea as if it’s a business plan – It’s like social entrepreneurship. There’s public judging and then a panel of judges too – I was a judge two years ago actually. The competition is very young at the moment, but it’s created a real movement; it’s ended up more than a competition. Now there’s a load of people who are going around and doing projects that are related to food security. The winner is only one tiny aspect of it really because now there are lots of really cool projects going on around the world. For example, I’m still working with insects and I don’t eat meat anyone – that was initiated from the idea our group had for the competition 3 or 4 years ago. Do you think insects could be brought into normal life in the UK? It’s all down to attitudes and perception. I’ve thought about it loads and it’s really frustrating that there’s this perception that insects are disgusting. If you grew up in the Central African Republic or somewhere similar, a caterpillar would be the equivalent of a steak. I’ve had one of those big, massive beetle larvae and it was unbelievably tasty, but the way it looks does make an impact. I grew up watching Indiana Jones and in the first movie where he’s clawing through all of those bugs it does look so disgusting, and that in James Bond too, where there’s a tarantula crawling over him and we are lead to feel anxious about it. Insects are filmed in a certain way, to create a certain reaction, but really they are not harmful – in a real-life situation they’d most likely be hiding away. There’s stuff that we consume regularly that is genuinely disgusting, like beer for example. The first time you try beer as a child you react by going ‘urgh’ – well, it is the fermented waste products of rotting yeast, barley, hops and sugar. It is revolting. Yet its consumption is accepted and encouraged in public because of its nice side affects. If we can convince people that there is positive side to eating insects then there is always a way in. It is always going to be hard though. 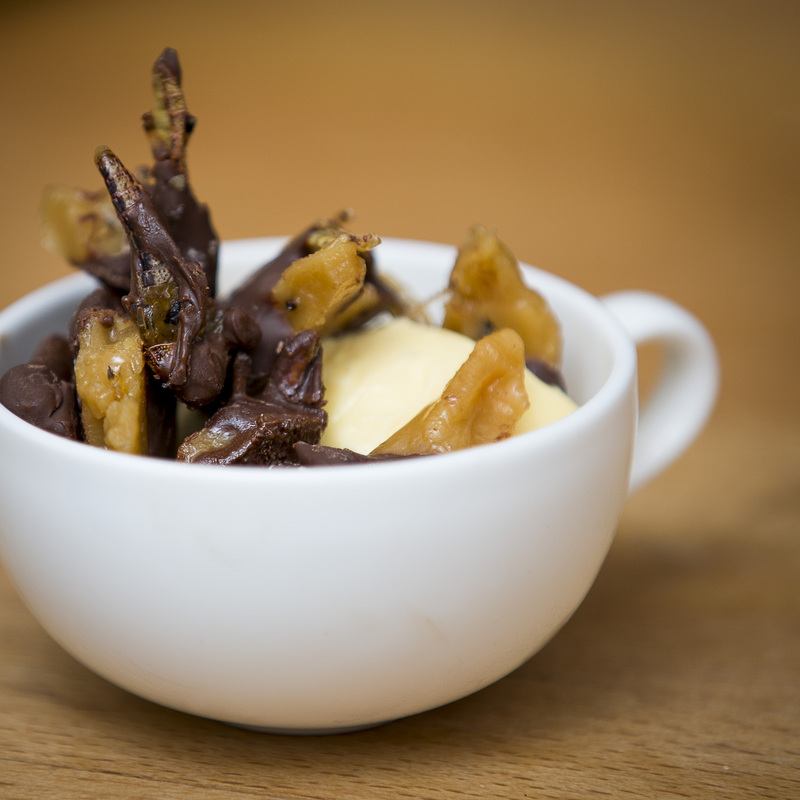 What was your first experience of eating insects? The first time was horrible. I was pretty skint because it was during the 3rd year of my PHD, and I ended up buying these vacuum packed locusts. I can’t even describe how horrible it looked: a congealed mass of horrible-ness. I’m pretty sure these were the kind of locusts that were only supposed to be fed to reptiles, but I thought, ‘You know what, we’re going to go for this!’ So, me and my mate Niall spent two hours taking the wings off these awful squashed things; I was determined. We made burgers and they were actually really good. At that time I was just looking into it as an idea, so we replaced half the meat with the locusts and we thought at least if we did that then we’d cut down half the meat we consumed. They were so good, and we were so surprised. They had a really nutty aroma. We made a little locust salad to go with it too. Are they expensive? Well, yeah they are. But no more expensive than say a piece of salmon at the supermarket. Or a proper prime cut of meat. I get my locusts alive now; they come from an insect breeder in Somerset. I used to get them in big sack of about 100 and you’d pull out the box and they’d start to swarm. You’ve got to take them out of the box alive – you don’t want to eat dead locusts. Although, saying that, the chance of catching anything from insects is much less than from meat. You’re not going to catch SARS from a locust. They’re so far removed from us in the food chain that they’re probably a better thing to consume. I like to get them alive and then freeze them so that I know I’ve killed them. I am the locust abattoir. It’s very biblical when they come crawling out, but it’s pretty exciting. Do you eat them to make up for protein because you don’t eat meat? No, it’s not for protein. I think people have weird misconceptions about food because of magazines like mens health; it’s all about getting protein and getting ‘well hench’. In reality you get everything you need from a balanced diet. You could not eat meat and never eat insects and you wouldn’t ever have issues with protein intake. Why do you eat them then? Do you really enjoy eating them? Yes, absolutely. The way I look at it now is that I’m trying to change people’s attitudes towards food. I use insects more as an ingredient rather than the main bit, and it’s genuinely a delicacy, but a really sustainable delicacy. In reality, meat is supposed to be eaten occasionally; it used to be. Now it’s become an everyday thing. I used to be guilty of having a sausage butty in the morning, then a chicken sandwich for lunch, and meat in the evening again, but in the 50s, for example, meat was for special occasions. A big piece of beef would be saved for a Sunday Dinner. I wanted to get away from having a big meaty centre piece with other smaller accompanying things like a few chips, but instead I realised that meat doesn’t have to be the main part. The insects are perfect for blending into a dish. Do you cook insects for friends? Yes, definitely. My mate Chris was doing a masters in Plymouth, and he used to work at pizza Express, and I stayed with him for a while while I was doing my PHD. He got his work extras like tomato sauce and we’d cook them up with the insects. We’d make a lovely locust bolognese. My girlfriend has been really receptive to the insects; she’s very open minded. In fact, the other night some guys came round to do some filming, and after that we sat on the sofa and got through about 50 locusts together. I fed the film crew locusts that day too. It’s amazing that every time I feed people locusts they really love them. I’ll have some insects with a couple of mates round my flat, with some drinks and I take them to parties. I can’t afford to eat them all the time at the moment because it’s not economically viable for me, but I’d like to, and when I’ve got the chance I’ll treat people to them. Could you breed your own insects? Yeah, definitely. Locusts aren’t actually the most sustainable insects because they have to be kept at a temperature of 30 degrees C, but compared to producing meat they’re still a lot more sustainable. Crickets are ok to breed in Britain, and they’ll feed on all sorts. Have you come across others who eat insects? Yes, there’s quite a big movement but it’s all spread out around the world. Holland appears to be the main place; they love it in Holland! I know a guy called Ger van de Wal, and he’s got a business called Deli bugs. He freeze-dries them and sends them over. There’s about 8 restaurants in Holland where they cook insects. There are a couple in London too. There’s a company called Eat Grub and a group called Ento. Ento are really interesting. They’re trying to make food with insects, but their products don’t look like insects. They make gourmet snacks. In Mexico some insects are a delicacy, and you’d pay the equivalent of 20 dollars a plate for them. There are these things called Gusanos which are also known as the Maguey Worm and there’s Escamoles which are ant larvae. Although, it’s not always a good thing to eat insects though, because some are so sought after and eaten so frequently the species are dying out. In Japan they eat hornets and wasps and stuff like that. Apparently wasps are ridiculously tasty. And bee larvae too. I’ve had wax worm larvae, and they are naturally parasitic around bee hives so they’ve got a bit of a honey-like waxy taste. They’re great in a taco. 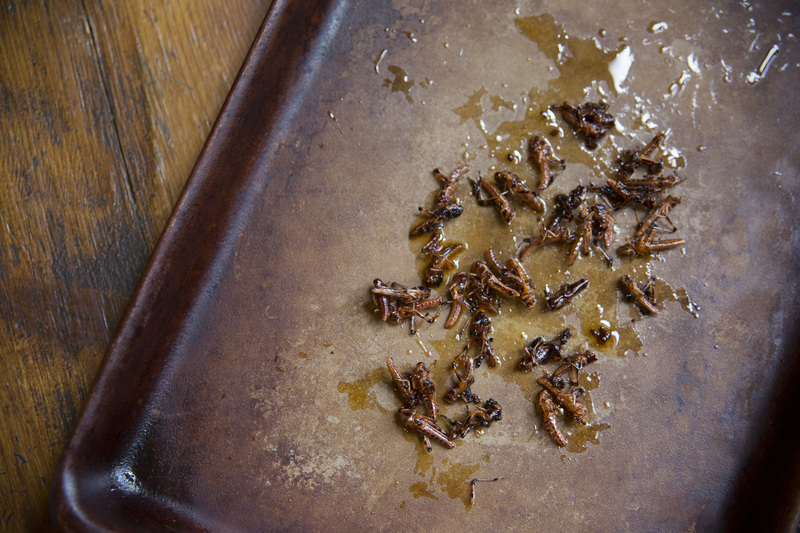 Were you always into food before cooking with insects? Yes. When I started eating insects I still wasn’t totally convinced by the anti-meat argument, but actually when I started getting into it a bit more it really opened my eyes to what you could actually do with insects rather than meat. I discovered that you can create pretty amazing stuff with all the ingredients that we have. When you eat meat it almost creates a bit of a block when you’re trying to be creative with dishes because you feel like you have to separate the meal into certain parts. So what do insects taste like? Can you compare the flavour to anything else? It’s not not meaty. Every insect has a different flavour, and there are 1700 species of edible insects that we know about. Grubs, beetle larvae, mealworms – they’re Darkling beetle larvae, not to put you off. Mealworms have a nutty taste to them, they can be nice to work with, but tricky too because they’re so small. You can make something like a walnut cake, and just exchange the nuts for mealworms, and you get a pretty similar effect. There’s big sago worms – Red Palm Weevil larvae – they taste so good. I tried one of those for the first time on This Morning. These sago worms, they taste like when you walk through a pine forest and it’s a bit wet and damp and you get this amazing aroma, it tastes like the smell of that: refreshing and kind of earthy. Locusts and crickets are remarkably sweet. I tried to get Holly Willoughby to try locusts but she wouldn’t try them. I was gutted. Locusts have got more carbohydrate in them than meat so that’s why they taste sweeter. Some have got quite a lot of protein in and others are more fatty. You can get up to 78g of protein per 100g in some of the grasshoppers! Others have a similar amount to beef – so more like 25-30g. They are all ridiculously high in protein. I’ve spent quite a bit of time dissecting them too and they’ve got quite white, stringy meat. They’ve got big muscles, so it makes sense. After carrying out the research do you feel hopeful that something can be done to tackle food security and the related environmental issues? No matter what we do, I don’t believe that any government is going to come up with any kind of agreement related to climate change and emissions, so there’s nothing we can do there. I think it’s important that we understand what’s going to happen to the world. We need to find ways to manipulate organisms to tolerate the world we’re creating for them. My PHD was related to the behaviour of algae and came from that notion. Sometimes it feels hopeless – everyday the world is teetering in a worse direction – but at the same time there’s an increasing movement to change things for the better. Humans are pretty good at adapting to problems, although at the same time we are running out of resources rapidly and we need to think about how to use them better. There are a lot of very clever and amazing people who are having great ideas related to solving these problems – I’d like to think that they can change the world. There are some countries that have managed to become fully sustainable now, and they’re 100% renewable. For example, Iceland reached that point at one stage. Mauritius and The Seychelles are massively conscious of how rising water levels are going to affect them in the future, but conversely, the bigger, more powerful countries like China and India are ignoring the problem. This is the issue, and even though there are many people who are doing good things, if the US, India and China aren’t willing to make changes then there’s nothing that the rest of the world can do. If every single person stopped driving in their personal lives, stopped taking hot showers and washing their dishes in hot water that would only have about a 28% effect on the whole issue. The main source of the problem is industry and big business. So on one hand it’s not the consumers fault, but at the same time there is a massive space for a grass-roots movement that will change everything. In reality the biggest thing that you can do that will make a difference on the planet is to not eat meat. That is the one. At the same time I believe it’s not about eating insects in exchange for cows; it’s more like looking at other resources that we naturally have around us, and just using them in a different way. We should embrace the good things that we already do – the things that seem to be working elsewhere around the world – and we might start to change things.